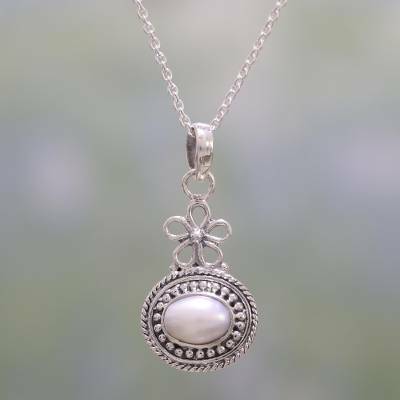 Cultured Pearl and Sterling Silver Pendant Necklace, "Pure Grace"
Designed by artisan Babun Dey of India, this pendant necklace radiates graceful elegance. Intricately handcrafted with dot and rope motifs, the sterling silver pendant holds a gleaming cultured freshwater pearl at its center. The artisan crafts a small flower at the top of the pendant for a charming touch. You can find cultured pearl pendant necklace 'Pure Grace' by Babun Dey in jewelry categories such as Birthstone Necklaces, PEARL Freshwater Necklaces, Sterling Silver Necklaces and Pendant Necklaces. Enjoy exploring these sections for other Novica treasures. For the price, this item is astonishingly beautiful; delicate craftsmanship, just lovely. "This necklace is the perfect gift "